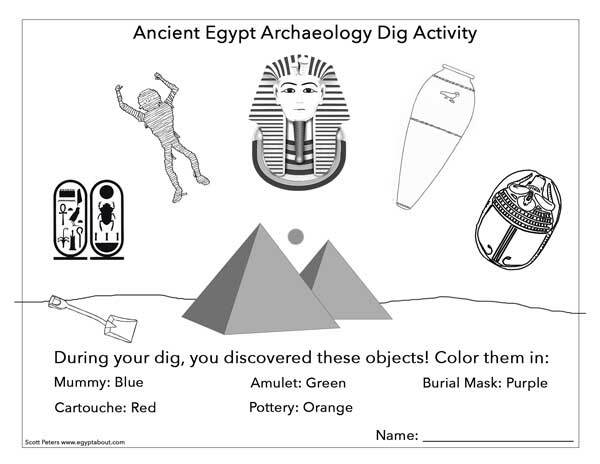 Print out this Kids Egypt Archaeology Worksheet! Here's a worksheet activity that I hope you'll enjoy. Imagine that you're an archaeologist. You're in Egypt to explore one of the giant pyramids. During your archaeological dig, you discovered these objects: a mummy, a cartouche, pottery, a scarab, and a burial mask. Color each item using the codes below. It's up to you to identify the artifacts, explorer!